The Earth as well as other planets are being attacked by missiles fired by sinister aliens. Your job is to protect the earth and shoot down as many missiles and other craft as you can. The gameplay on this game can be really challenging on later levels since the controls are a bit difficult to get used to, you hold in Button 2 to move the cursor around to shoot, and Button 1 fires. If you don't hold in Button 2, you'll simply move the ship around. But other then that the gameplay is fairly fun and fast paced with plenty of action. The graphics for this game on some levels are very nice and on others can be annoying as the aiming cursor can sometimes get lost from blending in with the background. 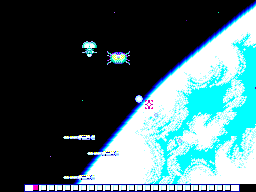 The planets are fairly well detailed, which is nice to see, and the moving enemies are quite well done too. The movie intro to the game is somewhat plain but is a nice display of what the game is about. The sound effects are pretty repetitive with the same explosion sounds and so forth, but the backing music is quite upbeat on most levels and adds well to the gameplay. When the game play gets faster, so does the music. 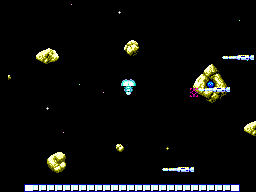 The controls in this game can be quite difficult to get the hang of as you cannot really shoot at the same time as moving your beacon, therefore this can be really difficult when missiles fill the screen. Also, having to hold down the button when moving the craft can place the target cursor far from any attacking craft. I would suggest not using a rapid fire unit since it can cause some real problems with moving the beacon and aiming at the same time. 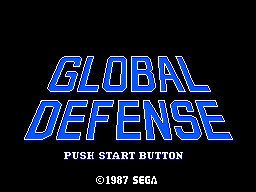 Global Defense is quite challenging at times, although when you finish the game it is a relief. There is a lot of replay value since you can aim to beat your scores once you finish the game. This can take a while to do which will keep you playing. Global Defense is a great game for fans of side scrolling shooters and vertical scrolling shooters (to an extent) as it combines the two to ensure entertaining and challeging gameplay. The music and graphics are very well presented, although the only downside is the controls take a little bit to get used to. Once this is done you probably will enjoy this game. I quite enjoy the offensive and defensive states alternating gameplay and this is why I enjoy this game and recommend you try it out.